Cozumel's mardi-gras, let the good times roll!!! Celebrate Carnival, or Mardi Gras, in Cozumel with costume contests, masquerade parties, dancing, live music, and colorful processions along the seafront. 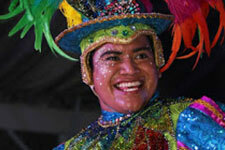 Celebrate Mardi Gras in Cozumel and let the good times roll! Also known as Carnival, this colorful festival takes place this year from February 22-28 and features masquerades, dancing in the streets, and parades along the downtown seafront. Wild costumes. Dancing in the streets. Drummers. Masquerades. 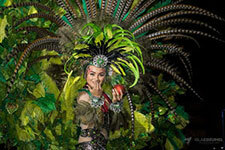 Carnival in Cozumel is one of the biggest celebrations of the year! 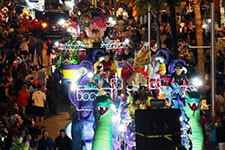 From February 22-28, you’ll find colorful parties and parades all across the island. Live music fills the air, free public dances pop up at parks, and the 2017 Carnival King and Queen will be crowned. Eat festive Carnival food and watch bands perform exciting Mexican music. You’ll also find dancing competitions around the city, along with the highlight of the festival - the big Carnival parades. Spectators line the streets, dancing with the performers and catching gifts that are tossed from the floats. It’s truly a unique experience. Some of the Carnival events in Cozumel require tickets, which can be purchased at City Hall - however, most of the activities are free. City Hall Park is the epicenter of the parties and performances, and the parades take place along the downtown seafront. You’ll find events every night, but the most exciting parties occur on Friday, February 24, Saturday, February 25, and Tuesday, February 28 - aka Fat Tuesday. Experience this year’s Mardi Gras celebrations on Cozumel and make the most of your vacation at our giant beach and water park. Do you want to know more about things to do in Cozumel? Please contact us today!